When Judge Carter gives Emma Greenwood one more chance by assigning community service, she thinks it's just one more card against her, cards like abandonment, foster care, and the thief trap she's in. Little does she know that there is more to her assignment that meets the eye, more like the mysterious old lady, Rose, who acts senile in front of her looming caregiver, but cleverly sane to Emma. As Rose's secrets unfold, so do Emma's. And now with friendship, love, and life on the line, Emma must decide if she is willing to be that Little Thief again. I love spending time with my family, especially outdoors. Virginia has some great places to hike. I also love to swim. 2.When did you first realize you were an author? I was in 7th grade and had to do a book report on Dear Mr. Henshaw. My teacher, Alan Petrunger, told me he would buy my book one day. Sadly, he died 10 years before I published Little Thief. I have a blog, that really needs to be updated, and write inspirational things on Facebook. It makes me happy when something I write uplifts, and inspires others. Raising a large family, teaching, and life in general take a lot of time. So my biggest obstacle to writing is giving it the time it needs. One way that I handle that is by bing writing, like NaNoWriMo. Little Thief's first draft came out of a crazy November. Once the first draft is done, I've fallen in love with my characters and want to give them the very best story I can. I think my purpose is to inspire others that with the right people in their lives, they can turn things around. We all hold a bad hand at some point or another. Sometimes we chose it, sometimes it was dealt to us, but regardless, there is always hope. Love plays a huge role in that, not cheap, superficial love, but meaningful love. I'm a very tactile learner. I personally love the feel of holding a print book in my hand, especially once it is worn a little. But ebooks are very convenient, and so easy to take with you. 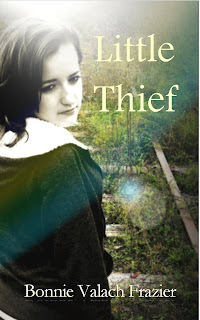 Little Thief is my first novel. I have this weird thing where I struggle to read the last book in a series because I don't want the story to end, so I don't know if a series will ever come to me and ask me to write it, because I'll probably just leave everyone hanging. The setting for Little Thief is in the New River Valley of Virginia where I live. I'm so blessed to live in such a beautiful place, how could I not share that with my readers. There is a story within the story that I discovered while asking myself, "What non-heinous crime could someone commit to end up on the FBI's most wanted list?" That was a refined search after discovering what most people do to end up on that list. Yikes! I have Neon coming out soon. We are in final line edit phase with it. Fake It is in revision phase (It is my Alopecia story as a YA novel) , and Obedience's Heart is in first draft progress. Years ago, I wrote the first and started the second in a YA Fantasy series (Hmmm....maybe a series has asked me to write it), and I think I will revisit that. Thank you so much for showcasing me and Little Thief today. A little fun fact about the book-- I wasn't sure what I wanted to title it until I was revising it one day and ran across a particular scene. I knew when I read it what the title would be. I hope you enjoy discovering the scene I'm taking about and a few more of Emma and Rose's secrets.